I was curious about the Allan goatskin leather bible. It’s unlikely I could use one due to some allergy I have to leather products, but thank you for reviewing this one. 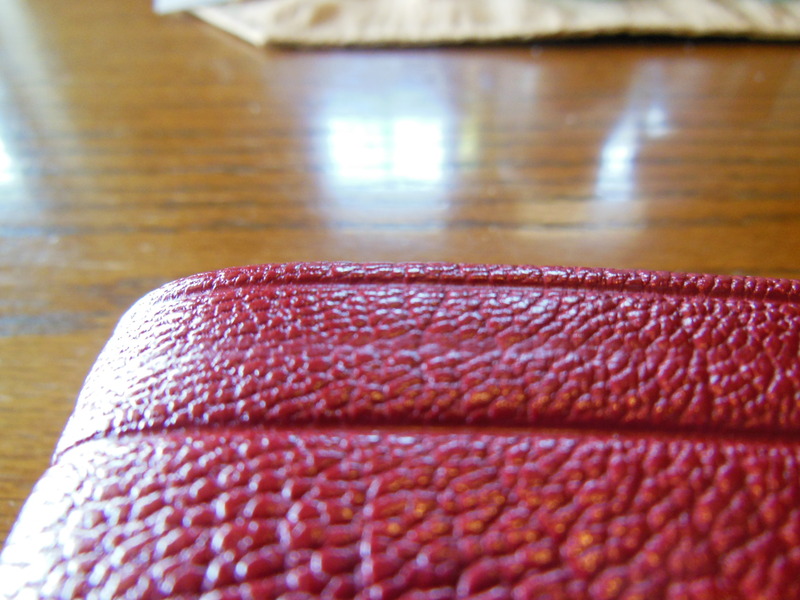 The thickness of the leather surprised me in the photos you took. It looks amazing. Congrats on finally getting your perfect bible. 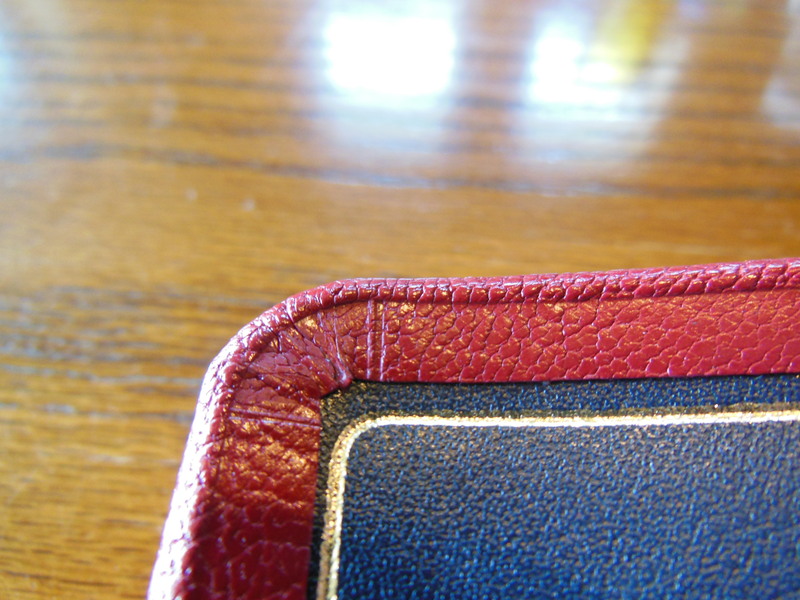 It is a thicker goatskin hide than what I’ve seen in the past from other Bibles. I am very pleased with it. I think the liner has something to do with the feel of the cover. It is leather as well. Hi! I’m so glad I found your blog after reading this review on evangelicalBible.com. I have a couple of questions for you. First, does this Bible have line matching? It’s hard to tell from the pictures. 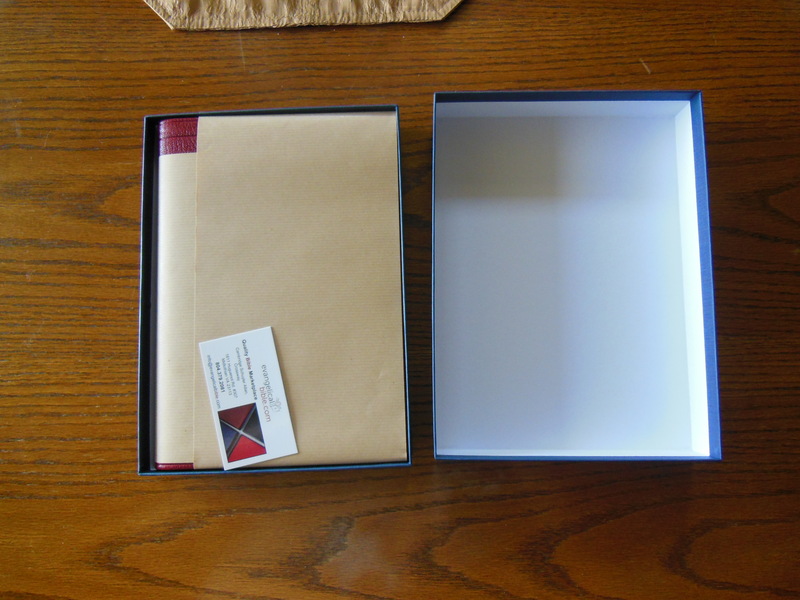 Secondly, is the cover supple enough that with use, do you think it would curve more over the book block to protect the pages? It looks a bit stiff but it’s also brand new. 🙂 I’m torn between this one in red and the ESV NCR in brown. They’re both so beautiful and the translations are close enough together for me. Thanks for the great review! No line matching on the NASB Readers from Allan. However, the paper looks better in real life than the pictures. They get, “enhanced” a bit by the camera, and or the website. The paper is pretty opaque. The cover has become more supple just in the couple weeks I’ve owned it. 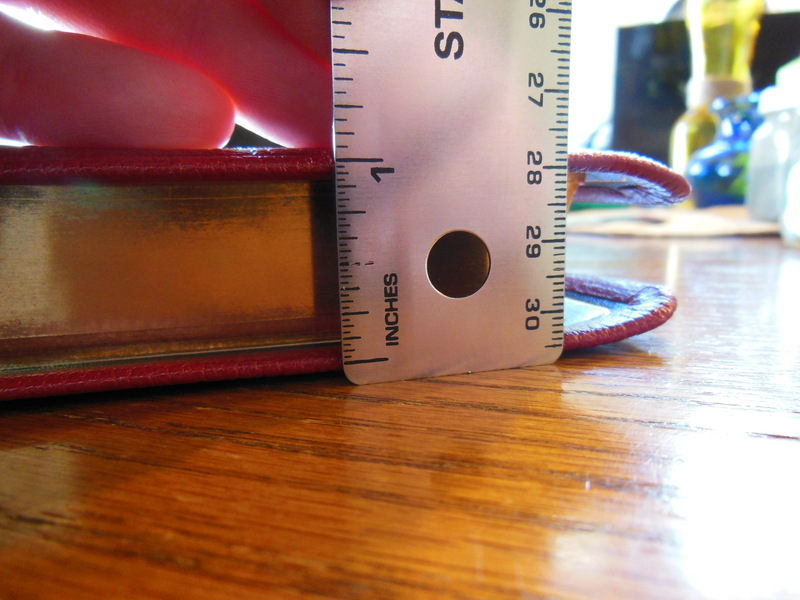 It is thicker than my clarion. It is also lined with leather instead of the synthetic material the clarion is lined with. I think it will last longer. It does not have a full yapp. The yapp is not made to curve over the pages on this one. They are large enough to offer more protection than the conventional yapps seen on mass produced Bibles. Firstly thanks for taking the time to wright this review. One of the issues with attending different churches for bible study or worship is that they tend to use different translations. My main Sunday church uses the TNIV (I am not really a fan of this, prefer something a bit more formal), another that I go to mid week uses the NRSV, my bible study group uses the ESV. We moved homes about 4 years ago and our old church used the NASB. Added to this there seams to be lots of websites and books telling us to use the KJV. So as you can imagine I have lots of bibles. But don’t have one that I use all the time and I feel that I end up studying the various translations rather than the word of God. 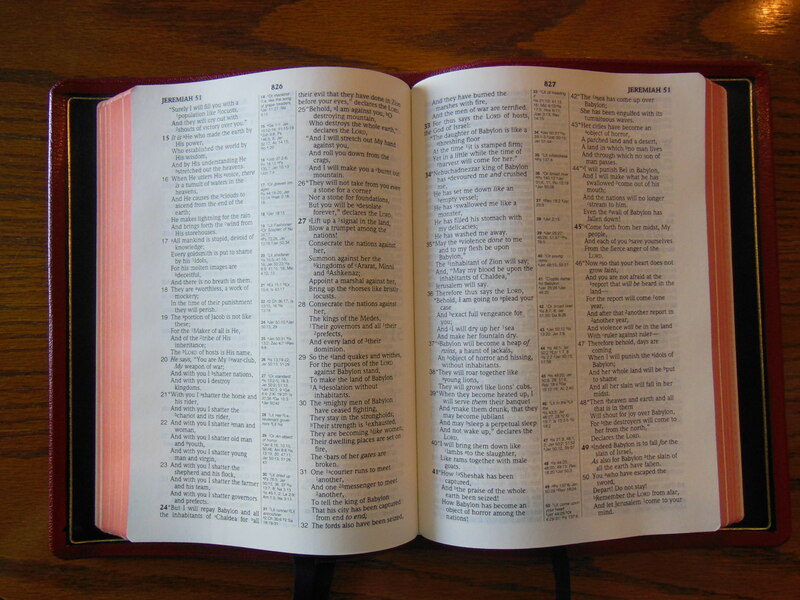 I would really like to have one bible that I use all the time, highlight, underline in. It needs to be a fairly formal translation, not too large a book but something that I am going to want to use for years. I recently bought an RL Allan Longprimer 52 and really like the colour and the format. However I am having issues with the text. When I read from it I keep missing parts of the text. Maybe its because the language is not familiar. I often find if I re read the same section in an ESV/NASB etc I notice things that I didn’t see in the KJV. Maybe I just need to give it a bit more time. 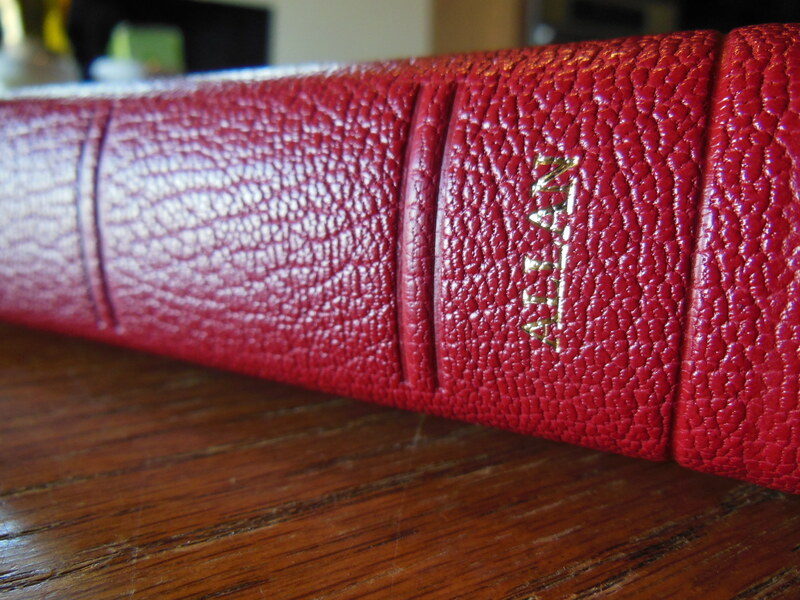 The Longprimer that I own is bright red with blue ribbons and very like the NASB version in this review. 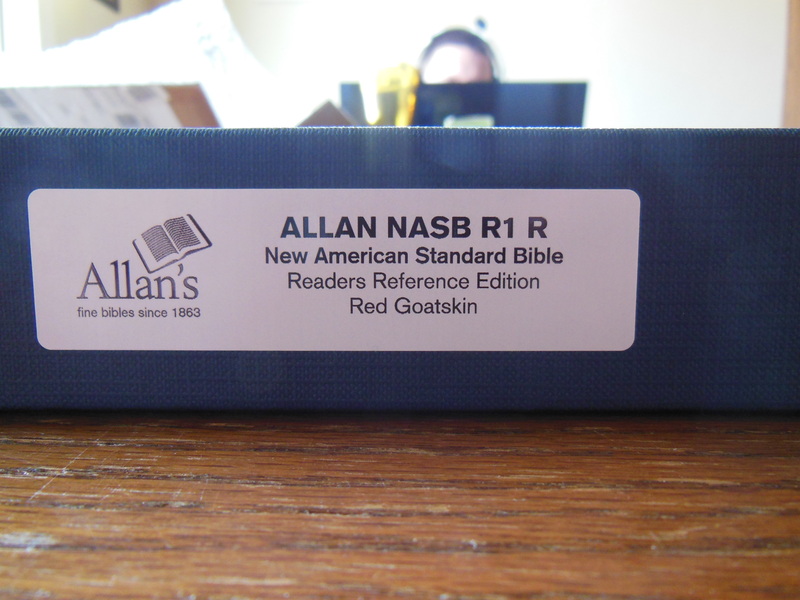 I have to say that I am very tempted to buy an Allan NASB, but not sure if I am ready to give up on the KJV just yet. 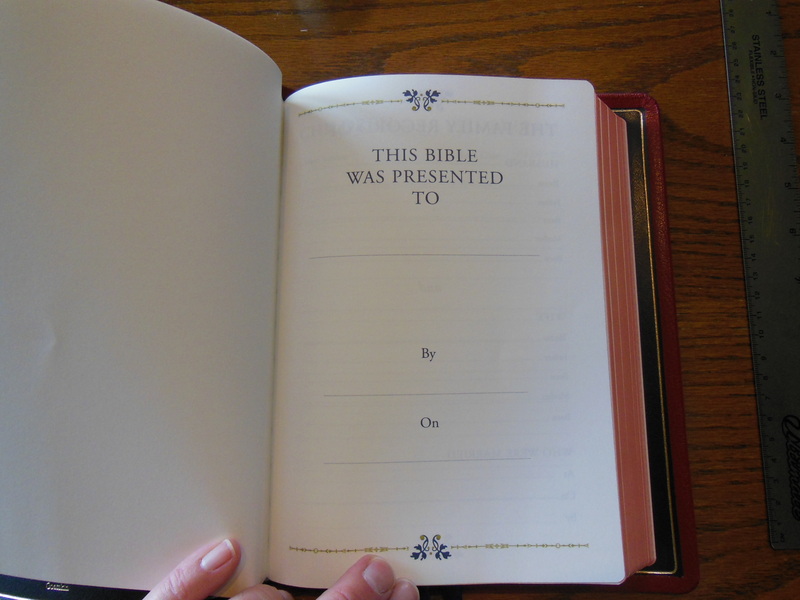 I also have a LCBP Noteless bible which I have started to mark up and put my notes in. I have also added a few extra ribbon markers. For the cost its a great product, but there are not shipping outside the USA at the moment so to get this one a friend in the states had to buy it for me. Have it shipped to his address and then ship it on to me. If you don’t mind me asking, what is your native language Alex? Perhaps I can help you find a Bible you’ll be happy with? I won’t use the TNIV due to the agenda driven gender inclusive translation. I don’t mind the KJV, but in light of the critical text would rather use a modern version. I don’t like the way the ESV reads. That is just personal preference. So, I am left with the NASB, and it is my favorite. I could be an NASBonlyist lol. There aren’t any good reasonable arguments to be a KJVonlyist. They have to suspend reason and do some pretty bad arguing to support their pov. Allan makes a double column verse format called the reader and they make a side column single column verse format called the scr. Both are very good. You can get them from Lockman Foundation for much less, but they are printed on less opaque paper and are made i China. The covers are not goat skin either. Thanks. I have ordered an Allan NASB double column reference. Hello Sir. Thank you for a great review. I just started to shop for a new Bible for my 14 year old daughter. I very quickly became overwhelmed by choice and price. I also discovered that i know very little about what makes a god, easy to read Bible. I don’t want to have super thin, see-thru paper, and i don’t want it filled with study notes and micro small print. I am 49, so i want a large print, and that will require even more thought into getting a “No Ghosting” Page. I don’t think i can afford even one, premium Bible but would like to ask for a suggestion on more affordable Bibles please? 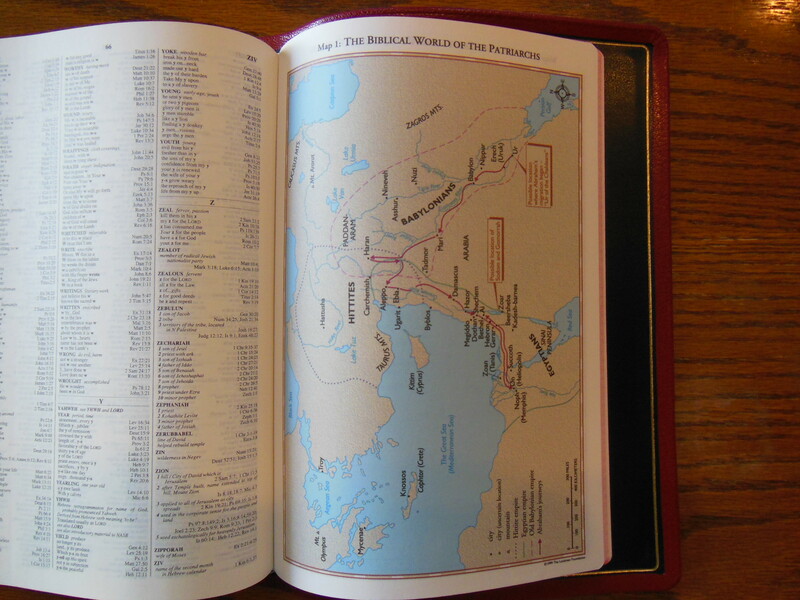 as far as translations go, I have had a big NIV study Bible for 20 years. Its a bit tattered. 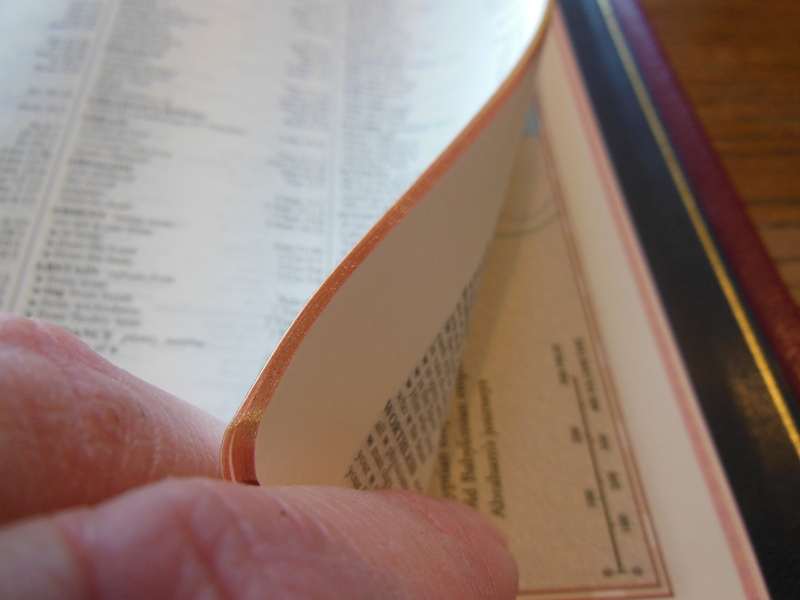 Our church uses the ESV. We have talked about changing to the ESV so we can follow along better at Church and Sunday school. I would like to ask about your comment about the NASB being more true to the original text. Could you show me a good link to study this please. Sorry for the long reply, and many questions. thanks for the help. Oh also, very important, don’t get translations that are written for people with the idea that they will be simpler to read. It is always better to stay true to the word, and if you or the person reading it, don’t understand something, look it up to learn it. I hope that helps. Thank you for the links Bob. There is some very nice options there. I forgot that i like the “Words of Jesus in Red” as well. I really like that to jump off the page at me. I will look thru theses options and see what they look like. Thank you again. Great review, and love the pictures at the end! Just a quick note–the NASB is a “formal equivalent” (as in stays close to the structure of the original text and language), not a “functional equivalent” (as in functions the same as the original text and language). I don’t know how I overlooked that. Thanks for catching it. I am glad you liked the review. I must have had my thoughts somewhere else. If I have one gripe with R L. Allan it is that a number of their book blocks are printed in China. R.L. 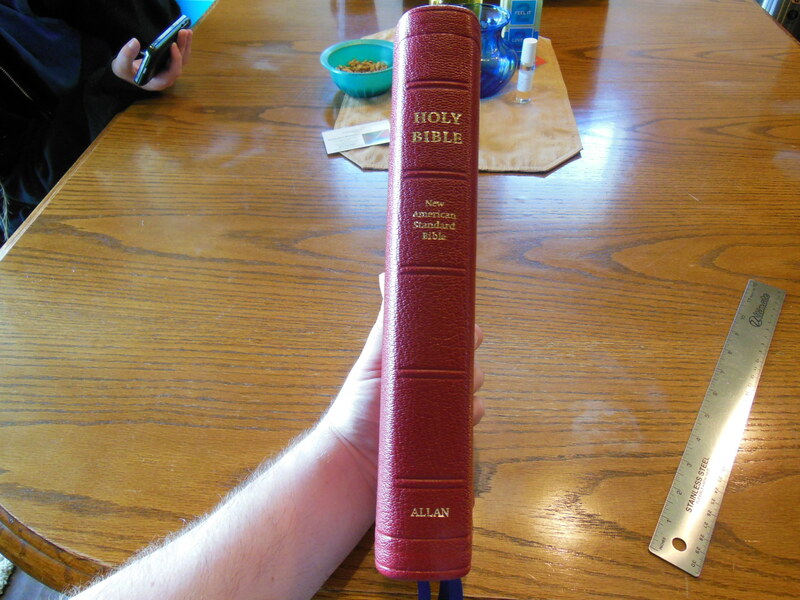 Allan fans make excuses for the practice (“yes, it is from China, but it is high quality”), but I there is something about the practice of printing a premium Bible in China that just doesn’t sit well. It is nice to see that this particular volume is printed and bound in the Netherlands. I have yet to determine the reason behind certain Allan text blocks being printed in China. My only thought would be that, perhaps, it comes down to using the original publisher’s current text blocks. Consistency would be better – it is somewhat disappointing for a publisher like Allan to farm out any printing at all to China. Thank you so much for your review! I am just discovering premier Bibles and this review was SO helpful! It has almost consumed me trying to find which beautiful Bible I want to buy. I have decided to buy one Cambridge (Wide Margin and possibly a Pitt Minnion) and one Allan. My question is do you know if the red was a limited edition that you reviewed? I am having difficulty finding it. Thank you! It may just be out of stock. They make limited runs. R. L. Allan is a small operation. If you don’t mind, could you tell me which Bible you already ordered that you are not happy with? Who is the publisher? Was it a Lockman Foundation Bible? Was it Zondervan? When you say NASV do you really mean NASB? I’m not trying to pick nits, I just need the info so I don’t recommend something you aren’t going to like. I also need to know about how much you want to spend, whether or not you like verse format or paragraph format, single column or double column, and so forth. Would it be better if it were tied to study notes? Where in Houston can I see and feel a high end Bible such as this. 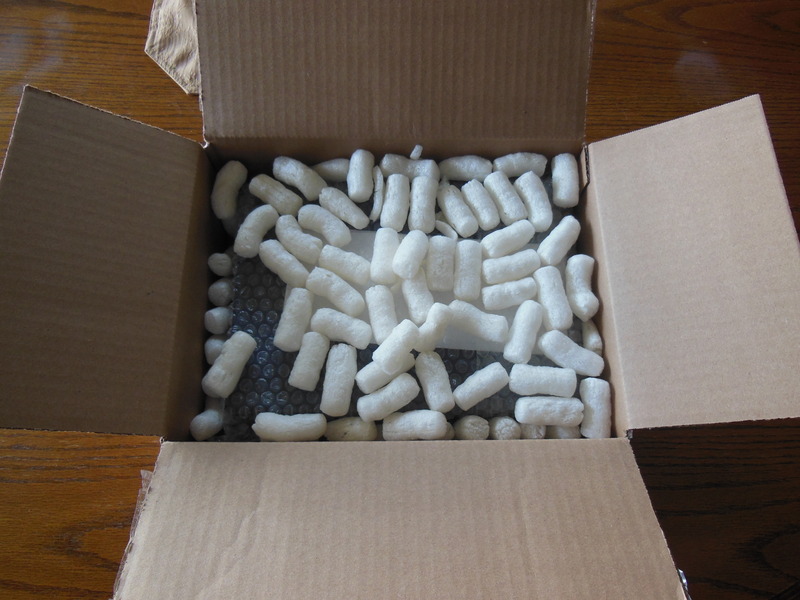 I hate online ordering anything. I don’t know exactly what I’m getting and I like to buy it and take it home. Catalog ordering is a very ineffective way of buying anything. I don’t believe there are any retail stores in America that carry this Bible. As far as I know, evangelicalbible.com is the only American company to sell them, and they are online only. If you want a study Bible, buy a study Bible. This is a reference Bible. The, “John Macarthur Study Bible” is a great choice. Sorry, but I don’t give Bibles away, over the internet, to people I don’t know. I’ve given most of the Bibles away that I’ve received. I have some left that I gift to people I know personally. Correction: printed by the Dutch, sent to London for the binding. At the time of the composition of the article, it was all done by Jongbloed. 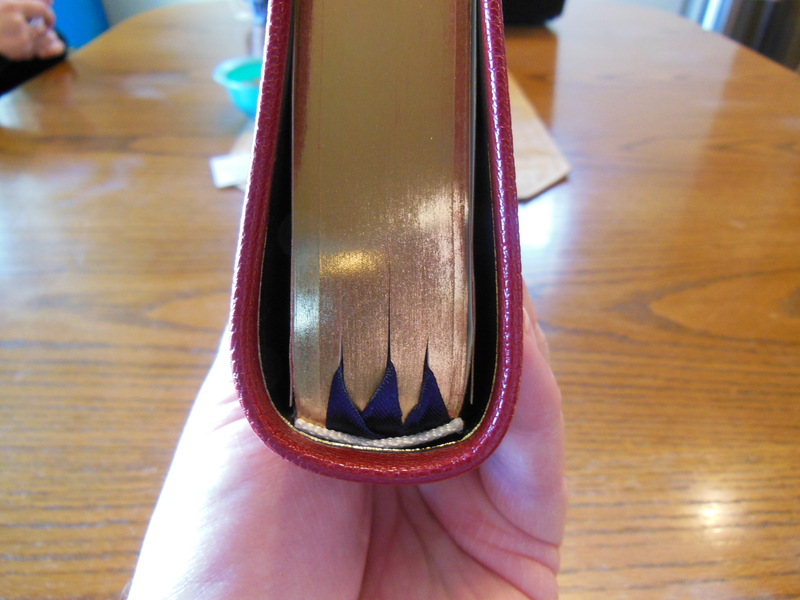 Since then the binding has moved. 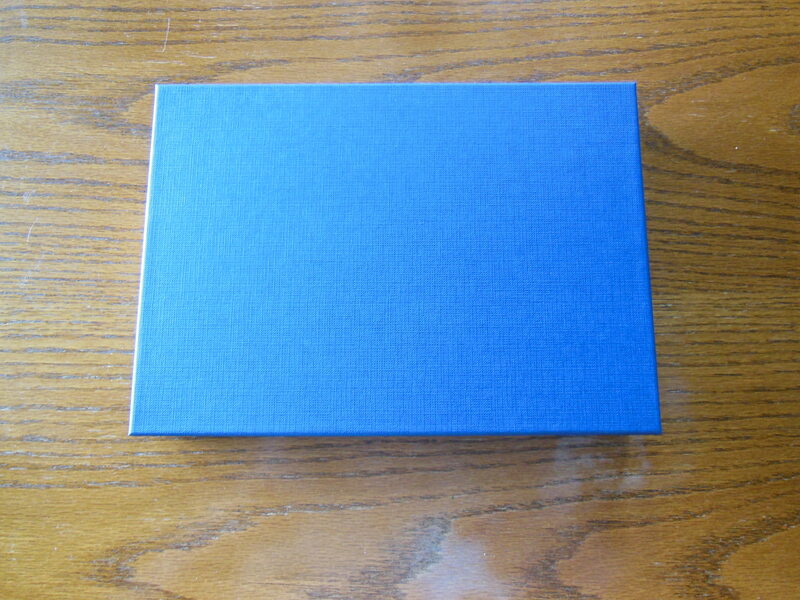 – Cover: hardcover (I have a Bible Cover) or leather (though I hate the polyurethane/bonded/crummy leathers). Any help or insight would be great – THANKS! 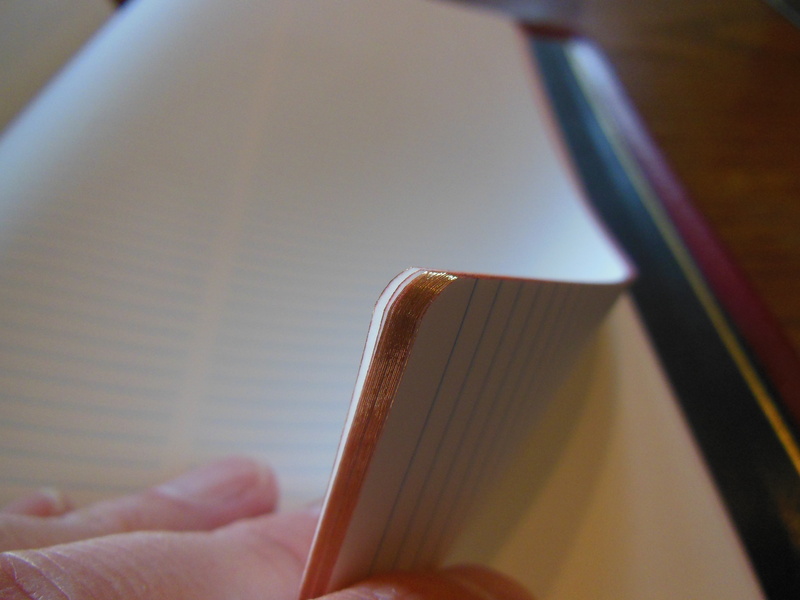 I like the idea of having wide margins to keep my thoughts, but worry about ink bleeding through. 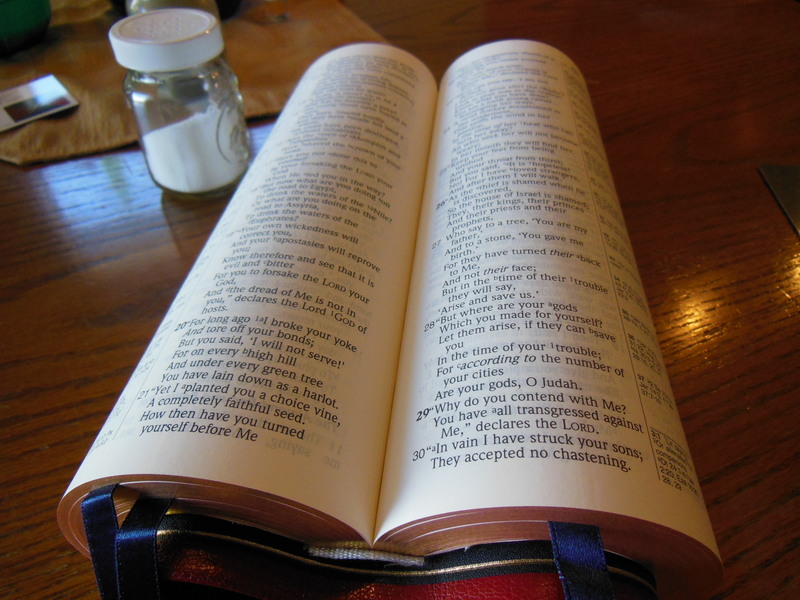 Why do you like NASB or ESV over, say, NIV? Well, I’ve never reviewed that one. I don’t get Zondervan Bibles unless I buy them myself. They don’t send me any for review. You would have to do some checking to see if it is sewn. A sewn binding is the number one feature you can get for longevity. I like the NASB because it is in my opinion the most accurate translation. It employs the formal equivalence philosophy for translation as opposed to the dynamic equivalence. Basically it means that experts in Koine Greek, Aramaic, and ancient Hebrew try to render each word in its modern English equivalent. The dynamic philosophy uses some language experts, and theologians to read a section of scripture, and figure out how to say it best in English by rearranging the sentence, using a more common phrase instead of one word, and paraphrasing more or less. Looking for the proverbial needle in the haystack, can you help? Plus I would buy as gifts also.